Minecraft’s last major update was released back in June. Considering it added horses, you could fairly argue that the updates changed the face of Minecraft irrevocably for the better. Yet it’s update 7 that Mojang are subtitling The Update that Changed the World. As it doubles the amount of biomes in the game, adds stained glass (which I think is up there with horses), and has a completely rewritten network code, you can tell why. It sounds like we’re a significant step closer to a proper modding api. The update is due out this Friday. 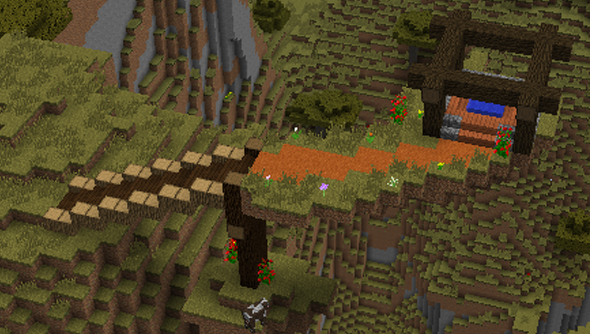 Double the amount of biomes, with new trees/flowers/blocks. Two new types of wood. Stained glass! With both blocks and panes. Packed ice, red sand, podzol. Lots of new flowers, including double-tall versions of current plants. Portals can be bigger sizes! Added more type of fish. Redone the fishing mechanics. Can now catch junk and treasure too. Put them in an item frame and hang them on your wall. They’re extra big! Lots of new colours for lots of blocks! Now both world (or server) specific. In multiplayer, it’s announced to everybody when you get an achievement. You can move your mouse over this in the chat to see what it was! Some new achievements and statistic types were added. Servers can now put a 64×64 image called “server-icon.png” in their folder, that you will see on your server list. You can see who’s online before joining a server; move your mouse over the player count! Lots of hidden preparation for allowing name changes. You can now have multiple selected. They can completely re-do your sounds, adding new ones or changing current ones. Servers can now recommend a resource pack for you to use. New commands to spawn mobs or blocks of any type. Clickable links to achievements and items. Click on somebody’s name in the chat to message them! Lots and lots of technical work! Completely rewrote how the network (multiplayer) works. Completely rewrote the sound manager. [MC-291] – Screenshots are treated as links in the console. [MC-715] – V-Sync in Window mode, settings not activated between sessions. [MC-1105] – Villagers act like it is Raining when they are in the Desert, and it Rains elsewhere. [MC-7449] – Silverfish infected Stone Brick varients appears as normal stone brick. [MC-15688] – Axe breaks all slabs in adventure mode. No drops for stone. [MC-26151] – Minecraft has advice on an error report that should be deleted. [MC-27284] – /scoreboard teams option color: Tab doesnt list all options. [MC-28405] – The saddle equip sound effect does not play when equipping a pig with a saddle.